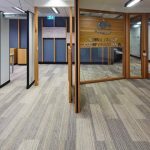 IA Design were engaged by Legal Aid Queensland to design their new Gold Coast office located across two floors at 7 Bay Street, Southport. The new workplace was designed to have a professional yet friendly ‘look and feel’ with an understated urban elegance befitting the nature of the legal services provided to clients. Each floor serves a distinct function for Legal Aid Queensland – level 2 is designated as the client-facing floor with a range of public interaction and waiting spaces, while level 3 is designated as a secure environment for legal and administrative staff offering a range of workstations, storage typologies, collaborative work zones and breakout spaces. Circulation was carefully considered to provide secure back-of-house egress for staff and intuitive orientation for clients and visitors. Design features include a sculptural reception counter, custom linear collaboration and storage joinery, and the use of feature wallpapers to key public areas, meeting rooms and lawyers offices. The breakout spaces were designed to provide a smart design aesthetic that could function equally as relaxation and casual workspace for the legal and administrative teams. IA Design were responsible for coordinating all elements of the design including architectural, services engineering, quantity surveying and private certification services, as well as the client’s representative during the construction process. The client delivery team proudly won an internal property award for their efforts – a fantastic effort!